Lisa Mallette of Fort White, FL, felt as if she had strayed while she was searching for a Siamese cat to adopt. She wanted a friend for her Lynx Point Siamese, adopted three years ago, so she entered her search criteria, including Breed: Siamese. But then up popped a sweet little face that was definitely not Siamese. “I still don’t know how I managed to stray from the search … ” Lisa says. 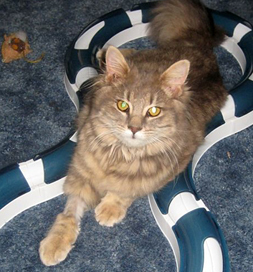 Junipurrr, rescued with a broken leg, recuperates in a loving home. Now an orange domestic medium-haired cat looked out at her from the computer monitor, and “… something about her photos and her story spoke to me,” Lisa says. SPCA Florida in Lakeland had listed the cat. Her description reported that she’d been found in a state park with a broken leg. The shelter folks arranged for surgery to repair her leg and then posted her on Petfinder. She needed a home in which to recuperate. For pets, straying can be a bad thing, but when searching on Petfinder, straying might just be fate lending a hand.